When positioning a ladder, is the ground or resting surface suitably dry, flat, strong and secure? If not, you must adapt the surface or take other measures to prevent the ladder becoming unstable. You should not undertake a task using a ladder or stepladder which will require you to work continuously for more than 30 minutes at a time. Ladders are classified according to general conditions and possible frequency of use. Light Trades Ladders: For medium duty where relatively low frequency and reasonably good conditions of use, carriage and storage occur. 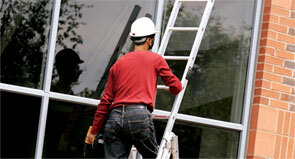 BS EN131 ladders are suitable for light trades applications. In addition, the higher rated BS2037 Class 1 and BS1129 Class 1 ladders can also be used for light trades applications. Domestic Ladders: For light duty only where frequency of use is low and good carriage and storage conditions occur. BS2037 Class 3 and BS1129 Class 3 ladders are suitable for domestic applications. 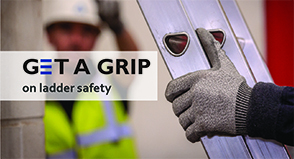 BS2037 Class 3 and BS1129 Class 3 ladders are NOT suitable for any light trades, trade or industrial applications. The Ladder Association’s Code of Practice covers all these points in detail. Find out more here.